I could write something cheesy about how these orange blueberry pineapple coconut muffins will send you on a little breakfast tropical vacation, in which you will dream about going somewhere warm, sunny, with ocean breezes and a very able-bodied person answering your every whim. But honestly, I don’t want to exoticize these muffins, and all of that sounds vaguely colonialistic, so I’ll spare you the sit-next-to-a-pristine-pool-with-a-pina-colada-in-hand-fantasy and just give you the recipe for these scrumptious muffins. You’ll want to eat them forever. You might even make a second batch next week. And maybe you’ll even double that, so you can freeze some and continue enjoying them as the days pass…You might even want to eat them for breakfast every day on the way to work so that you can pretend you’re going on vacation instead of to teach and video-tape yourself looking like a fool (and using so many hand-gestures while talking to your students…). Maybe that’s just me. 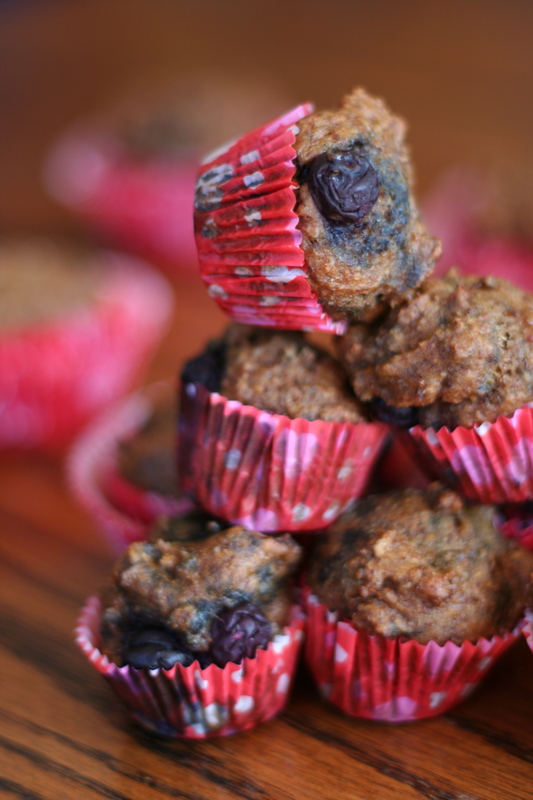 But I think you’ll want to bake these muffins at least once and enjoy every single fruity bite of their goodness. This is kind of a random post, but hey, it’s been a long week and it’s not over yet! 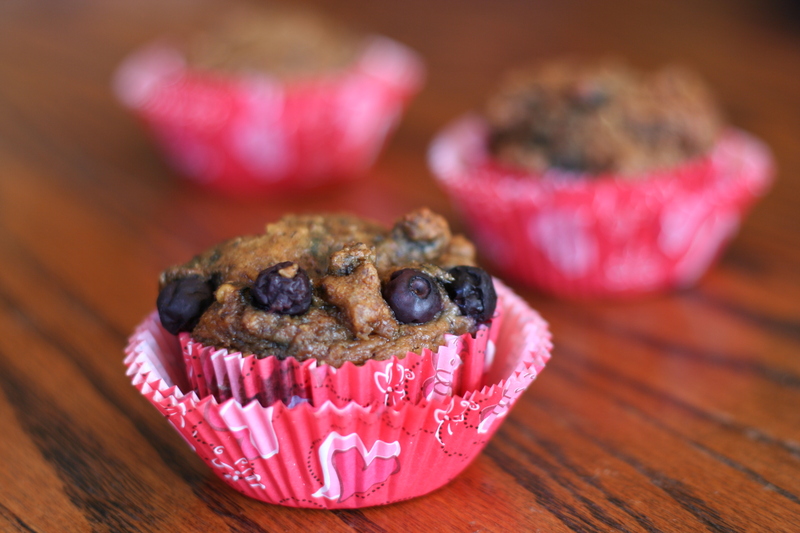 And, let’s just notice that these muffins are purely agave- and fruit-sweetened, so they’re 110% healthy, right? I can eat them all day long? 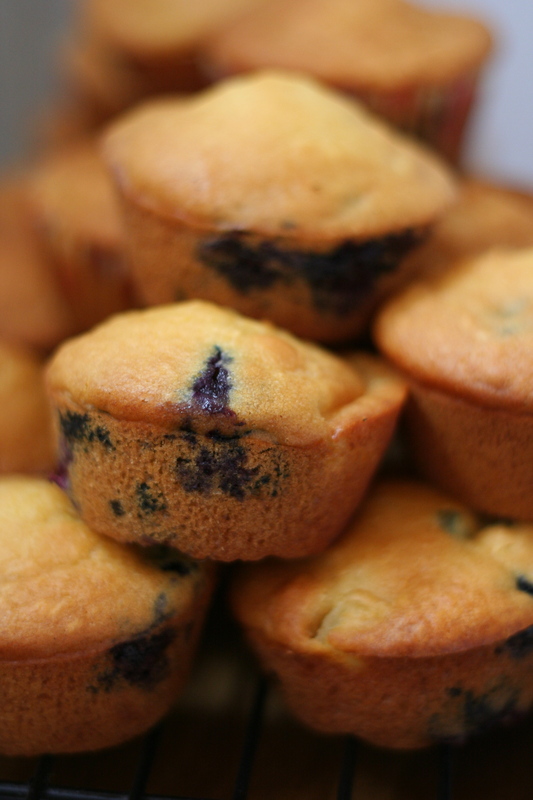 Preheat the oven to 350 degrees F. Grease a muffin tin or use cupcake papers to line the tin. In a large bowl, combine the flour, baking powder, baking soda, and salt, and whisk. In a separate bowl, dissolve the egg replacer into the orange juice, then add the water, agave, orange zest, and oil, and mix until smooth. Combine the wet ingredients with the flour mixture. Fold in the coconut, pineapple, and blueberries. Pour the batter into the muffin tin almost to the top and bake for 20-25 minutes, or until a toothpick comes out clean. Set aside to cool. Those were the only requests made by my friend Rachel for her birthday cake. Actually, she suggested a loaf-type-dessert, but I thought that since it was her birthday after all, she should have something that more closely resembled a cake! I’ve always loved this recipe, which originated from The Candle Cafe Cookbook, and is for their Lemon-Poppyseed Muffins. However, as I made it this time with my baking buddy Julie, I took out the cane sugar (substituting date sugar instead), added extra lemon zest, and doubled the whole recipe to fit into a large bundt cake pan. I’ve never baked with date sugar before, and I wasn’t sure exactly how it would react in a cake – the results were fabulous. I barely noticed a difference from how the original recipe tastes, except for a slightly “darker” flavor, a little bit like I had added a touch of molasses. It’s nice to know that you can substitute a totally natural sweetener for the highly processed white cane sugar that is in so many baked goods, making them a little more nutritious as well as ethically healthy (i.e. : animal-friendly). 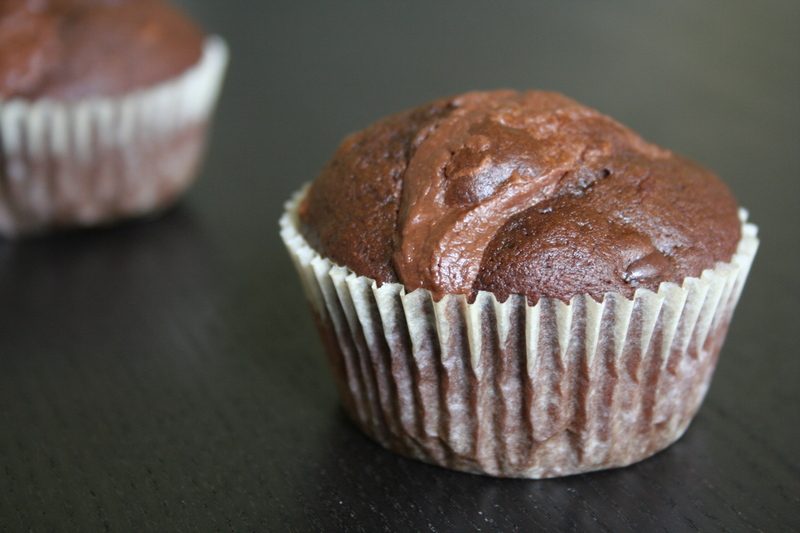 Personally, I loved this cake as it was (and I love it so dearly in muffin form too! ), with tons of crunchy poppy seeds in every single bite, but I was told that it would be extra delicious with a lemon glaze drizzled over. I would do this right after taking the cake out of the oven, and as the cake cools it will create a crispy crunchy sweet top. …And after writing this post and looking at my pictures again, I’m wishing I had an extra slice leftover to nosh on right now! Preheat the oven to 350 degrees F. Grease a muffin tin, line tins with cupcake papers, or grease and flour a bundt pan. Sift the flours, sugar, baking soda, baking powder, and salt into a large mixing bowl and whisk to mix. In a separate bowl, whisk together the margarine, maple syrup, almond milk, and lemon juice until foamy. Pour the wet ingredients into the flour mixture and mix until the batter is smooth. Fold in the poppy seeds and lemon zest. Pour the batter into the muffin tins or bundt pan, dividing evenly and spreading flat across the top. Bake on a center rack of the oven for 20-25 minutes for muffins, or 55 minutes for a cake – make sure to do a toothpick test by sticking a toothpick into the center, and if it comes out clean you can take the pan out of the oven. The muffins are best served while warm, but if you choose to make the cake then leave it to cool in the pan for at least 30 minutes before extracting it. Take your cake out of the pan and let cool completely before eating. 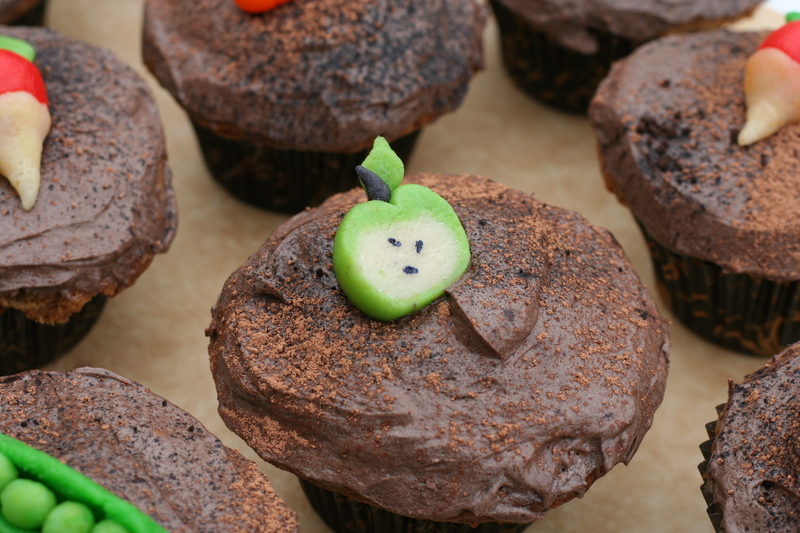 I was making these cupcakes for the Vegan Bakesale happening this afternoon, and since it is a benefit for the Laurel Elementary School gardening program, I decided a garden theme would be appropriate. The cupcake base is a Carrot-Zucchini Muffin (from Colleen Patrick-Goudreau’s The Joy of Vegan Baking), and is certainly moderately healthy (it has veggies in it!!). I threw together the frosting (sorry I don’t have a recipe to share, I didn’t measure this time!) with Earth Balance and Tofutti Cream Cheese as the creamy base, with vanilla extract, powdered sugar, and cocoa powder whipped in. 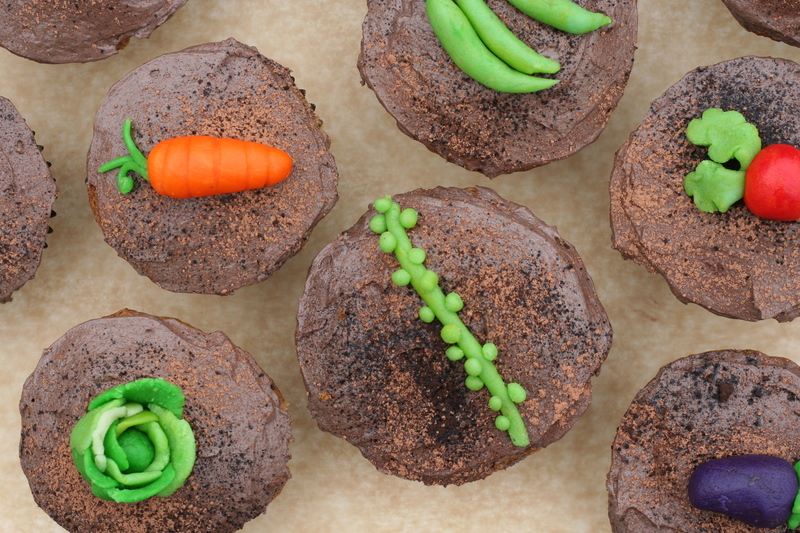 I sifted regular cocoa powder on top of each cupcake, along with a sprinkling of Black Cocoa Powder to make the top look like rich dark soil. We then plunked our Marzipan veggies on top and called it a day. Hopefully they’ll be a big hit at the bakesale! 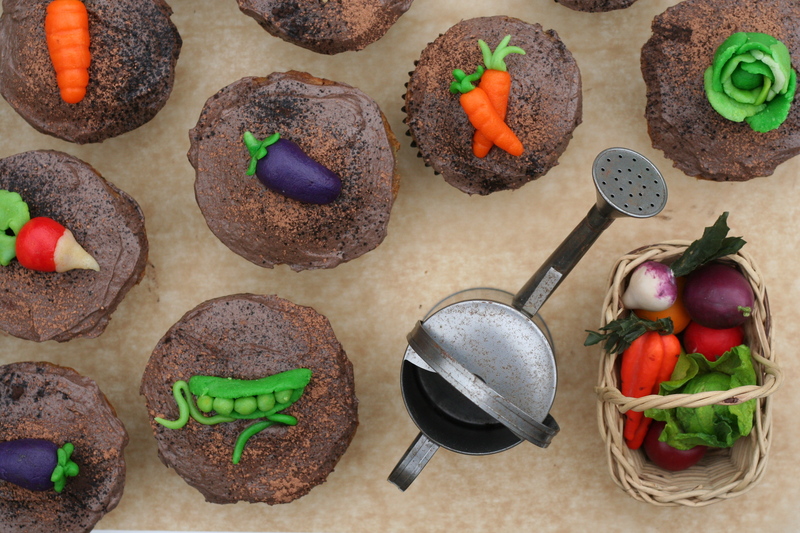 The vegetables are made from Marzipan! They are fully edible, although perhaps too cute to really eat. It took a loooooong time, but Julie, Sari, and I made 20 tiny vegetables (and an apple…) out of Marzipan that we dyed with food coloring. It was like making little sculptures out of modeling clay, except you get to eat them afterwords. It was really fun to make them, and we got quite carried away making different shapes. We made peas in a pod, carrots, string beans, tomatoes, radishes, lettuce, purple cabbage, eggplants, apples, and my favorite which was the stalk of brussels sprouts! I’m in New York on vacation right now, visiting friends (who are basically like family; it is amazing to be able to drop in on a whim, and be welcomed so warmly! And every time I visit, I feel like I never left…). It is cold here. Very cold. My bones were cold today…And I know, I’m from California, I might be a weather-wimp, but really, all the East Coasters were cold too! One thing that makes me warmer is cooking, and keeping the oven on. We baked apple muffins this morning, and after braving the biting wind to get into the city to the Whitney Museum and back, we came home and made a hearty “kitchen sink” vegetable soup. You must be wondering, the title of this post has nothing to do with apples or soups, so will I get to the point yet? 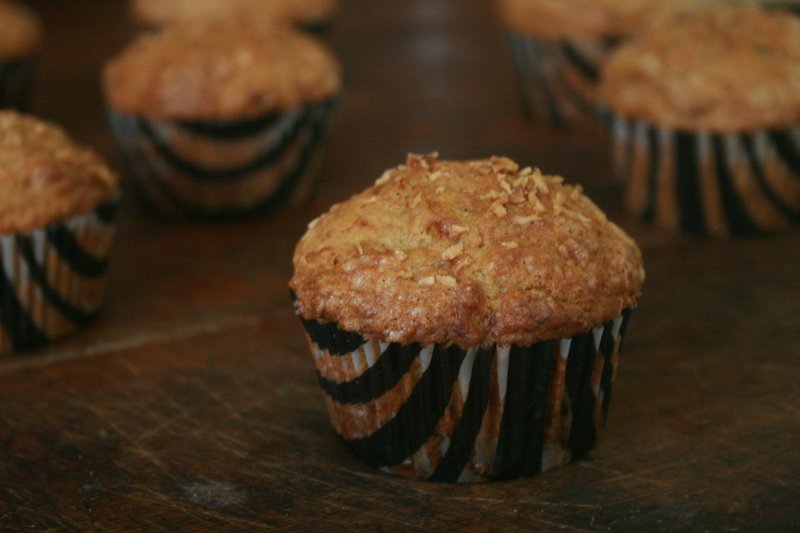 Truthfully, this post is about the muffins I made last week. I had a close family friend and her son over for brunch (it was actually on Christmas Eve morning, has it really been that long? ), and I wanted to surprise them with a tasty treat to follow our bagels. It needed to be both adult- and kid-friendly, and have a seasonal twist so that it would feel appropriate for the holiday. I was inspired by Isa’s Gingerbread Flax Muffins on The Post Punk Kitchen Blog, and whipped them up that morning. They were easy and scrumptious. The only changes I made to Isa’s recipe were to add about a tablespoon of freshly grated ginger and a sprinkling of some diced candied ginger on top. I also put a pinch of coarse sugar on top of each muffin to give it a crunchy outside. 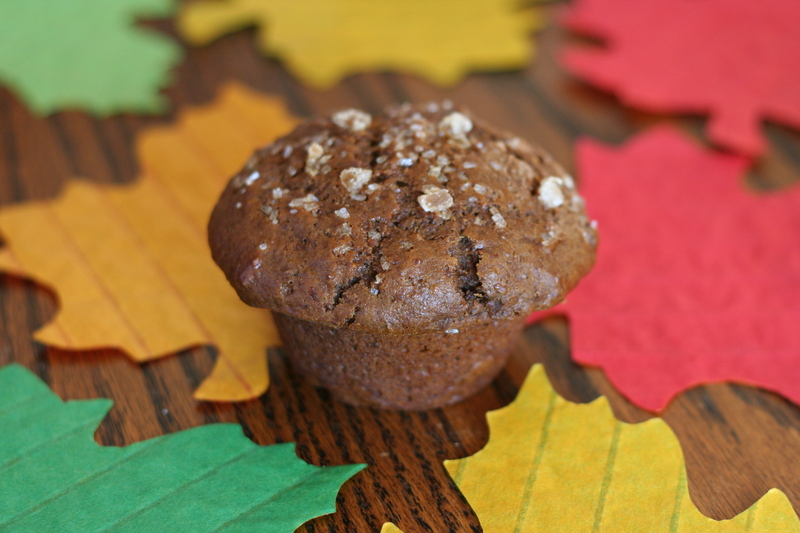 Soft and moist in the middle, with a healthy dose of gingerbread spices, this muffin pleased everyone’s palettes and even had 3 year old Dylan coming back for seconds, thirds, and tastes of a fourth!